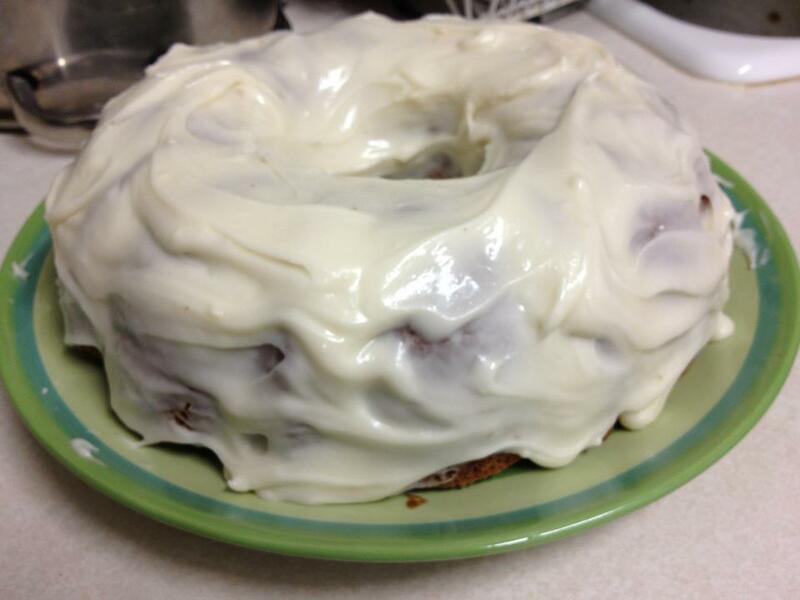 I obtained this recipe, after suffering its wonderous, moist, frosted phenomenon, from old family friends. They deserve credit for this amazing cake I continue to make at least once a year. It’s perfect for that rich, Christmas or Thanksgiving dessert you were assigned to bring to the party. Start by preheating the oven to 300 degrees Farenheit. Grease and flour either a 13″ x 9″, 2 round cake pans, or a bundt cake pan (these would also make excellent cupcakes). Beat all ingredients with a hand mixer on low for 30 seconds. Beat for a remaining 3 minutes on high. Pour batter into your pan. Bake for approximately 40-45 minutes for a rectangular pan or 30-35 minutes for the round pans or bundt cake. When a toothpick comes out of the center clean, the cake is finished cooking. While the cake is cooling, whip up the frosting. In a mixing bowl, beat the cream cheese, milk and vanilla together on low-speed with a hand mixer until smooth. In doses of about one cup, add in the powdered sugar. Cream together until frosting is smooth and spreadable. Spread cream cheese frosting over cake. Enjoy. I doubted the fridge’s holding of unexpired sour cream, and used cream cheese in the cake instead only to find out the next day we had not one, but TWO fresh cartons of sour cream. Whoops. The only difference I noticed was the dense cake was less moist than its sour cream compromised counter-part. It was still enticing, then again, what, covered in cream cheese frosting, wouldn’t be? I made a mini sampler size for taste testing, just in case the cake didn’t turn out using cream cheese inside the cake. Andrew refused to touch it, so I gave it to my mom and Dave first. They all agreed it was well-prepared and delectable, despite my impatience for both the trip to the store to buy sour cream and to allow the oven to fully heat up to 300 degrees Farenheit. The spices remind me of sipping on a gingerbread latte from Starbucks, or slurping up some Pumpkin Black Bean Soup (minus the cayenne), not to mention it makes the whole house smell like a lit Yankee Candle. Each bite is dribbled in luscious cream-colored gobs of icing. Our basil plant has officially turned into a tree. What better way to use the endless amounts of basil growing before the fall/winter chill hits us than by making homemade pesto? To make the pesto, combine all ingredients in a food processor and pulse until throughly blended. I left out the pine nuts, because I put them into my pasta. Just a pinch of salt, pepper and nutmeg to taste. The roasted garlic (place in a sided cookie sheet with olive oil, shell and all, and broil for 2-5 minutes) and basil are the main flavor bursts in pesto. If the ingredients aren’t blending well, add a little more olive oil. Cook your pasta according to the directions on the box and drain in a strainer. In the same pan, while the pasta is draining, toss half the packet of Knorr Pesto Sauce Mix and heavy cream together. As you can see, I overcooked my pasta and some stuck to the bottom of the pan. Pull out your pasta just before it is finished cooking, as it will continue to cook while it drains in the strainer. Mix the cream and seasoning until the cream becomes a light green soup. Next add in the fresh pesto and a pinch of cayenne. Heat until the blend is thickened and simmering. If you want to make it entirely fresh, leave out the pesto seasoning packet. You’ll just have to adjust with a few spices from your cabinet to counter what you take away. Place drained pasta into an individual sized pasta bowl. Top with a spoonful or two of the pesto pasta sauce. Grate some Parmesan cheese atop the sauce and top with a sprinkling of roasted pine nuts. This pasta is a pesto lovers dream. It would even be good with black olives mixed in. It’s more of a heavy, winter meal from the healthy fat of the olive oil and cream. Roasting the garlic and pine nuts adds that unique smoky, rustic taste at the back of your tongue, which is a must-try. I like to use the shell pasta because it captures gobs of the pesto sauce and the little pine nuts, so you can savor every aspect of this dish together in one. This is a great treat to wake up to or snack on at lunch. It can get your kids and husbands to eat their vegetables without even knowing it. I decided to make this when my boss gave us all club sized zucchini’s from her garden. I didn’t even use half of the zucchini with two batches of this bread. That’s some healthy soil right there. Preheat the oven to 325 degrees Farenheit. In a bowl, mix together your dry ingredients: flour, brown sugar, baking soda, cinnamon, nutmeg and chocolate chips. The whole wheat flour is an acquired taste, so if you prefer, use white. I used mini semi-sweet chocolate chips to accentuate the mini bread loaves I ended up with. In another bowl, whisk together the egg, vanilla extract, butter, Diet Coke, milk and zucchini. The recipe I found on skinnytaste.com reccommended apple sauce, which would make this bread much sweeter and super moist, but we didn’t have any in the cabinet or fridge. I took Caroline’s earlier suggestion of Diet Coke in cake batter in place of the wet ingredients. I minimized the wet ingredients, but added milk for a thicker, heartier dough. You can also grate the zucchini directly into the dry ingredients bowl, as it will sit directly on top instead of sinking to the bottom of the wet ingredient bowl so you can see how much you have grated. I used a simple hand cheese grater, which was perfect for the huge size of the zucchini. Combine your wet ingredient bowl into the dry ingredient bowl and stir until just mixed. You will see the beautiful green of the zucchini radiating against the dark chocolate chips. Scrumptious. Crisco/butter either a 9″ x 5″ bread loaf pan or for my second batch I used 4 mini aluminum loaf pans for an individual touch I could give away at work. These come with cute plastic covers, but will need a lot of attention with the Crisco/butter in each crease. Pour the batter in your pan. Bake for 50-60 minutes at 325 degrees Farenheit. If you are using the mini pans, cook for approximately 35-45 minutes or until a toothpick comes out clean. The zucchini adds a nice texture to the bread, but the taste really comes from the chocolate chips, wheat flour and brown sugar. I personally didn’t notice a difference in taste when using Diet Coke in place of the “wet ingredients” but in the future will use apple sauce for bread as it will add more moisture. The Diet Coke would be great in a box cake mix in place of the eggs, oil and water. The wheat flour adds a healthy flavor and slight grain texture that may or may not put you off, so as mentioned, white flour will suffice. Like my boss did, your husband and kids may ask you if there is really zucchini in the bread. Add a little butter to your warm slice of bread for moisture, or eat directly from the pan. Either way this chocolatey, thick and flavorful bread is quite appetizing. This is a Paula Deen recipe that I changed around a little with the Raspberry sauce, so expect a lot of butter, cream and an amazing breakfast/brunch. My college friends were in town for a wedding and found this delicious. 2 tablespoons white wine, I used a dry white wine to take away from the sweetness. Preheat the oven to 350 degrees Farenheit (unless you are using the overnight method). Generously butter a 9 x 13 glass baking dish. Slice your french bread into approximately one-inch thick slices. The recipe calls for 20, but I had a hard time fitting them all in a single layer in the casserole dish. After jamming the slices in, I realized an easier layout for the bread would be to layer them resting on top of each other, like a cheese tray. In a mixing bowl, whip together the eggs, milk, half-and-half, nutmeg, cinnamon, sugar, and vanilla with either a whisk or a hand mixer. I also added in a little bit of black pepper. The mix should be thouroughly blended, so I suggest the hand mixer. I used a fork and had two egg yolks still whole when I poured the batter over the toast, the next step. When pouring the egg combo, be sure to cover all the bread slices evenly. I kept going and just baked the bread immediately after I soaked the bread slices. You can also cover up the baking pan and refrigerate overnight for a softer texture and fully soaked bread. When your bread has chilled overnight, or you are ready to immediately bake your dish, whip up the praline topping. In another bowl, intermingle all the ingredients until well-integrated. Evenly paint on the mixture to the top of your bread covering the entire dish creating a sweet, slightly thick, top layer. Cook in the oven for 45 minutes or until the egg mixture turns into a solid, slightly mushy state. The eggs should have cooked thoroughly through and the praline topping will have melted and become a dark brown, crystallized crust. While your brunch is baking, you can heat up the fruit topping. I didn’t have the ingredients Paula called for, so I whipped up my own version. In a saucepan, combine all the ingredients on low heat stirring until completely heated. Set aside for later. It was a little sweet, so you could probably remove either the corn syrup or honey. The wine definitely brought down the kid-in-a-candy-store sweetness with a grown up kick, so if you follow the recipe exactly I would make sure to add this. Any fruit and preserve would work, so if blueberries are in season and cheaper, try a variation of the raspberry topping. When the french toast bake is finished, dish out one-two slices per plate and top with the raspberry topping. Delectable! The best part was definitely the crunchy, candied pecans crusting onto the gooey, egg-thick french toast. It didn’t stick your teeth, but sure tasted like a taboo candy that would rot out your molars. The fresh fruit on top made the dish feel healthy and brought another level of flavor to the agreeably sweetened, nutty french toast. A great brunch item paired with a mimosa or watermelon cooler and some fresh fruit. These are perfect to just eat plain while you’re relaxing on a Sunday in front of the t.v. or with salsa, hummus, and any other dip you enjoy with tortilla chips. Start by pouring a decent amount of vegetable oil into a frying pan and heating over medium heat. Then cut up your stack of tortillas with a pizza cutter into small triangles. Prepare an area with paper towels to drain the tortilla chips after they are cooked. If you take a small piece of tortilla and toss it in the oil, it should immediately start fizzling. That is how you know the oil is hot enough. Continue placing the tortilla triangles into the oil (making sure not to splash yourself with the blistering oil) in batches small enough to allow them to completely stay immersed in the hot oil and not stick to another chip.They should cook for approximately 5-10 minutes or until crunchy and slightly brown on the under half. Pull them out with grill tongs and place them on the waiting paper towels ( I places mine on top of a baking sheet to keep the counter clean). Repeat until all your slices of tortilla are transformed into crispy chips. While your batches are cooking you can toss together the spice ingredients. We had a Tupperware full of a salt and pepper mixture to which I added a little more pepper, a dash of red pepper flakes, 2 Tbsp of chili powder, a dash of nutmeg, a dash of allspice, and 2 teaspoons of cumin. Sprinkle the seasoning atop your cooling, draining chips while they are still slightly hot. This is the best way to make sure it sticks. Your homemade chips are complete! These are much easier on the stomach than greasy, fried food you get at a restaurant. You can also throw a little olive oil atop the tortilla triangles and place them in the oven for a healthier version. I really wanted hummus, only we had nothing to eat it with so these chips were the perfect treat. It took a few batches to get my desired crunch. The seasoning I tossed together tasted a lot like the seasoning you find at Red Robin on their french fries, so if you are making potatoes or homemade fries this seasoning would be delish.